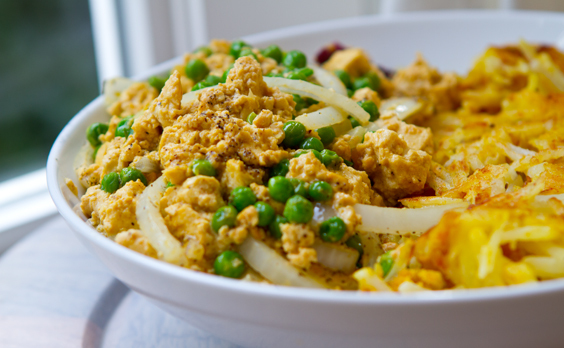 Truffled Tofu Scramble with Umeboshi, Peas, Onion. 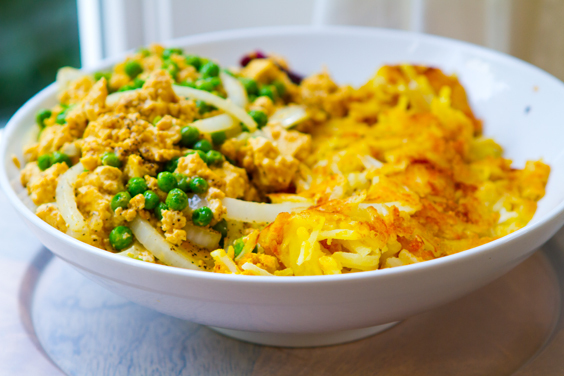 It's no secret that I love a good tofu scramble - for breakfast, lunch or dinner. 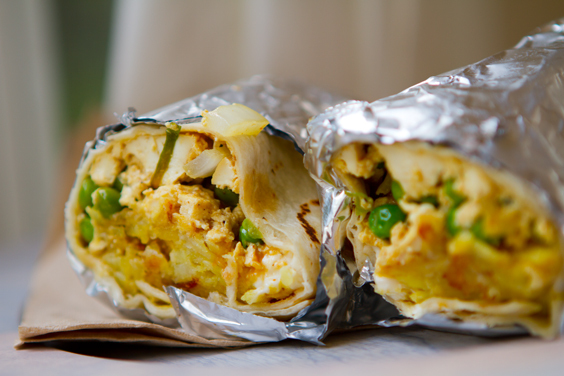 There are so many ways to serve up a this classic vegan tofu dish: Tofu Pie Pockets, Breakfast Burrito, Classic Scramble with veggies and vegan cheese. Tofu gets a bad reputation for being "bland" - but I am always quick to defend this iconic vegetarian ingredient. I adore tofu! I love that you can infuse this fluffy, silky, creamy white edible "sponge" with whatever herbs, spices and flavors you crave. Spicy, sweet, sassy or savory. And for me, it doesn't get much more exciting that a sizzling hot, fresh from the skillet plate of tofu scramble. Side of hash browns, fruit, toast and hot tea or latte. Lovely. Team tofu. More "tofu" recipes I absolutely love: Tofu Salad, Tofu Celery Crunch Salad, Chipotle Tofu Sandwich and many more - my 15 ways to cook with tofu here. And recently I discovered a few new secret ingredients to make my scrambles even better. 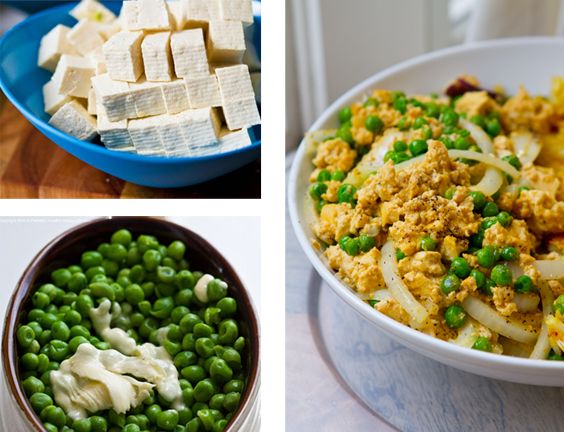 Check out my 6 Secret Scramble Ingredients here - then click ahead to get my Truffled Tofu Scramble recipe.. Pass the peas please. 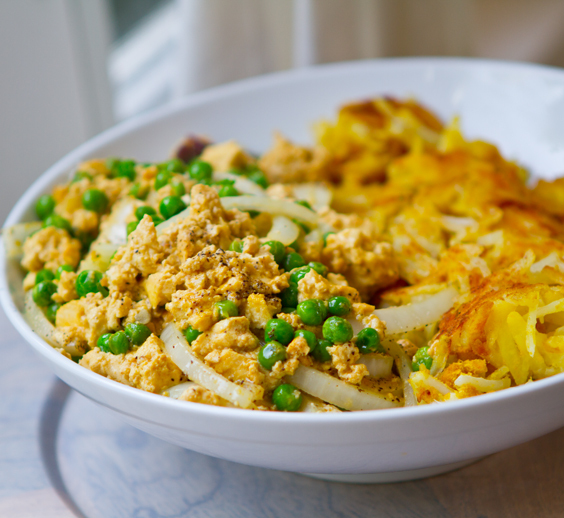 Peas are sweet and savory - and look quite lovely served up in a scramble. Add in some of my new secret ingredients like umeboshi vinegar and truffle oil and voila - amazingly high brow dish with some low-brow effort. Easy. I also whipped up some cheesy hash browns to roll my scramble into a breakfast burrito. Splash of hot sauce and swipe of Vegenaise inside the tortilla. More about my scramble secret ingredients here. 4. Saute until the tofu begins to brown and firm up a bit - about 4-5 minutes. 5. Add in the frozen peas - cook for another 2 minutes until peas are hot. Add in optional vegan butter. StumbleUpon it! 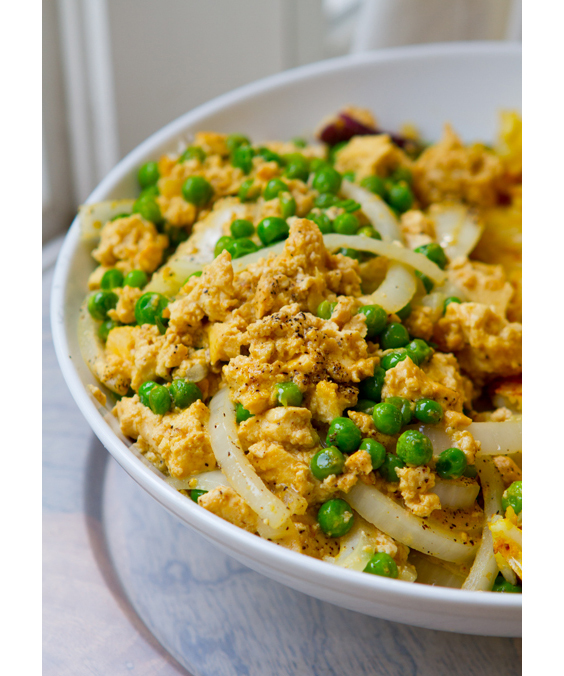 If you are a fan of tofu and this truffled tofu scramble - please show your love by StumblingUpon this post! Button at top.